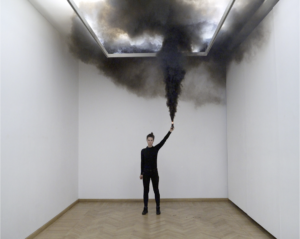 On 23 March 2018, in a black protest organised by women for the third time, some of the participants of the Warsaw march fired smoke flares. Police intervened, the legal demonstration was stopped for a moment, but after a while women were released. Pictures of high poles of black, billowing smoke circled the media and were memorised as one of the visual representations of that afternoon. They also opened a space for discussion on the radicalisation of women’s movement. The work is a part of Sputnik Photos group show “The Geometry of Imagination” at Mai Mano Haz in Budapest, Hungary.